Mile Markers: Ron's Double Big Daddy! 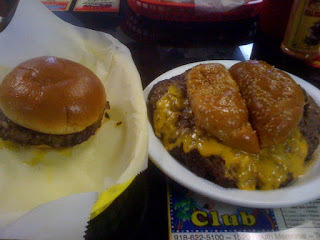 Here are three pictures of three different Double Big Daddy's from Ron's Hamburgers in Tulsa. These all came from the location at 71st and Mingo. 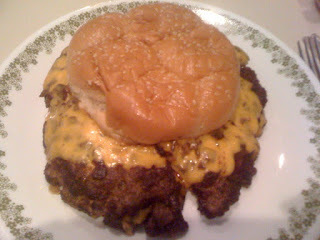 The first picture gives you an idea how big it is placed along side their regular hamburger. 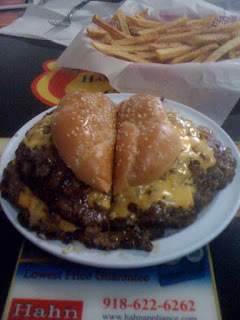 For a full description of this great greasy mess see my very first entry on this blog on November 7, 2009. If you like a good greasy cheeseburger you have to make a trip to Ron's. If you will click on the title above it is linked to their website.